Do you like to enjoy an occasional alcoholic beverage? There's a good chance that you do. Do you like to enjoy a… more-than-occasional alcoholic beverage? If the answer is yes, there's also a good chance that your body does some amazing chemical reactions (or whatever) to morph an otherwise poisonous substance into euphoria, then into a feeling of hot, sweaty death the next morning. But thinking about potential liver damage somewhere down the line is such a bummer when you're just trying to relax after a long day at work, or a long morning at work, or a few weeks of unemployment. What most people don't realize is that, rather than eating "tons of meat" to heal after a night of alcohol use (which doesn't work anyway), an herb called milk thistle might help protect your liver from damage. 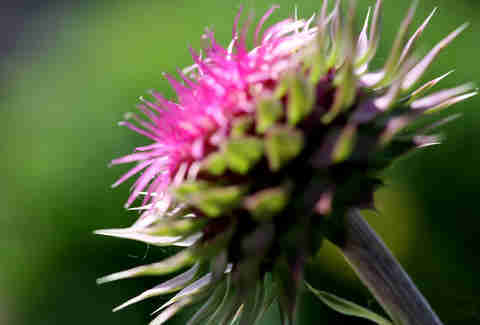 Milk thistle has been a staple in many a wine connoisseur's cabinet for years. British wine critic Jancis Robinson (she picks out wines for the Queen's cellar! ), whose new book The 24-Hour Wine Expert comes out in September, has been touting the herb's magical liver-healing benefits since she first wrote about it on her website in 2001. "I take it regularly when I have a heavy day’s tasting or a heavy night's feasting," she says. And while she acknowledges that some of milk thistle's power may be the placebo effect at work, she definitely notices a difference. "It may or may not be fanciful, but I do think I feel much less affected by the after-effects of alcohol (let's not use the H-word) when I take milk thistle," she adds. "My co-author of Wine Grapes, José Vouillamoz in Switzerland, is a professional specialist in medicinal plants, and has not uncovered any evidence to contradict taking it to stave off the harmful effects of toxins such as alcohol." Drinking in abundance isn't great for your credit card bill or Tinder correspondence, but it's downright garbage for your liver. Enter milk thistle to help undo some of that booze-induced damage. "The active ingredient of milk thistle, silymarin, helps to improve liver function tests by acting as an antioxidant and anti-inflammatory in the hepatic cells," says Dr. Westin Childs. "It also helps the liver metabolize toxic compounds, lowering the damage to liver cells in the process." Although it's helpful, Dr. Childs adds it's not a cure-all; it doesn't reduce all of the damage from drinking in excess. "It can help heal the process once the person has quit drinking, but by itself is not enough to counteract all of the effects of the alcohol," he notes, though if you're trying to go on a serious detox, you may just want to add milk thistle. 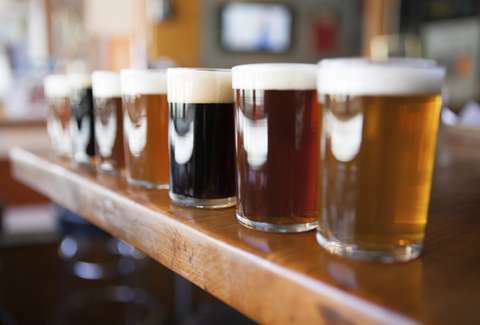 Beer is essentially water for the Germans, according to the stereotypes, which are always true. Suffice it to say that people drink lots of it over in Deutschland. Luckily, Germany's Commission E, which is roughly equivalent to the Food & Drug Administration in the United States, is ahead of the game. It recommends milk thistle to treat liver toxicity, and if milk thistle is good enough for ze Germans, it's damn well good enough for you. Right here in the good ol' United States, the National Cancer Institute claims that silymarin "protects against cell damage and stimulates repair of liver tissue." So popping some milk thistle on the reg could act like a shield on your poor, poor liver. Any time "the eyes and skin turneth yellow" on someone, the ancients turned to milk thistle. They also only lived like 40 years and thought leeches were a great way to prevent illness. So you should still probably call a doctor if you turneth yellow, but it's good to know milk thistle has been on the map for liver damage since forever. 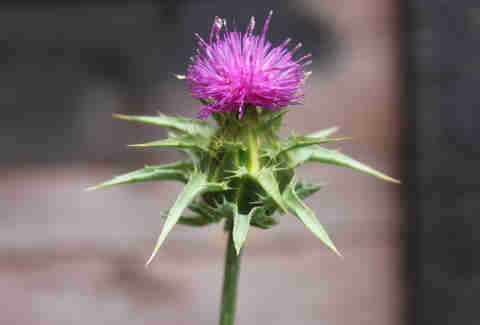 Where can I get milk thistle, and is it safe to take? You can find dry powdered milk thistle capsules in the vitamins and supplements aisle at pretty much any drugstore, though it's also available in tincture or liquid form. Watch out if you're allergic to ragweed, chrysanthemums, marigolds, chamomile, yarrow, or daisies, because you may also react to milk thistle. More generally, if you think you have a liver or alcohol problem, you should probably seek help from a medical professional rather than take an herb. If you're just looking for a little extra liver protection, though... it can't hurt to try, right? Christina Stiehl is a Health and fitness staff writer for Thrillist. She's planning on stocking up on milk thistle. Follow her @ChristinaStiehl.